Okay, not exactly Haussmannian—but it still looks Parisian to me. And thanks for showing us the "other side." I have seen the other side of Paris and I am well aware of it's existence. Just like many big cities in America, like New York, Boston, San Francisco; there is the side the tourists see and then the reality of other areas. I was reading last night about just how difficult life was for the average Parisian after the Franco-Prussian War at the end of the 19th century and the first decades of the 20th century. It was really only the Professionals and the Elites that lived the Parisian lifestyle that most people associate with that time period, for many Parisians their lives were lived mostly hand to mouth. Paris The Secret History by Andrew Hussey. Actually these buildings are located in Malakoff not Chatillon. I see them everyday since I live very near in Montrouge. When I see the huge number of buildings that are destroyed and re-built in this area since some years I hope those ones are next. Thank you Eric for showing you are aware of both sides. Like the best and the worst in a city. Your photo is beatiful anyway. And I like to picture you stopping and catching a moment like this one on your way home. How very right of you to show another side of Paris. I am not a Paris virgin and have discovered the many ethnic neighborhoods inside CDG. I still have a hard time reconciling them to the Haussmannian stereotype! How about a picture around the Indian neighborhood, Metro Stalingrad (I think)? I find this picture has a shabby Parisian charm to it.It is begging to be painted....maybe by LOIS! I like the paint of old signs showing through, and although I can see this isn't a wealthy neighborhood, it's not squalor, either. Look how clean the street is! This looked familiar Eric. I used to live in l'Hay-les-Roses and at first, the photo reminded me of Gentilly, Arcueil... It is a beautiful and sad picture in the same time. What a coincidence. I just watched the surreal modern version of "Moulin Rouge". People panned this movie. It's a snappy version of "Camille" and "La Traviata". It's schmaltzy and I love it. And "Slumdog Millionaire" is on now. I love the character of these buildings ~ they have lived. This is sad. 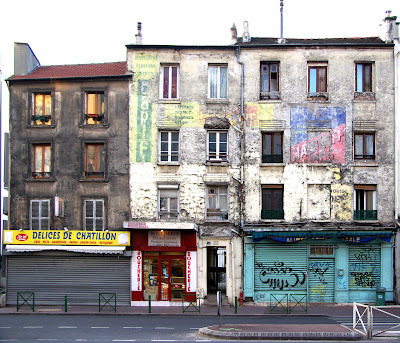 When I saw some of these old buldings with grafiti and a run-down appearance, I thought about the people who lived there. How different their lives must be from the 'typical' Parisian. I noticed the shops all are/were food places. Is this a Muslum area? Thank you for showing us Paris, warts and all. It may be just outside Paris, but it still IS Paris. The Paris not usually shown around the world. I guess all big cities have these kinds of neighborhoods, even in supposedly 'first world' countries. It can't be helped, not until we find a way of distributing wealth more equitably. Ah well. We can but dream. And work for it. As soon as I loaded the blog, the first words that came to my mind were "finally!!!" I crave the "typical Paris" the Paris nobody talks about, the "ethnic" food with the tea in the little glasses, and all these other things that make Paris, Paris. You actually don't have far to go even within Paris to find buildings such as this one, and these neighborhoods are a completely different experience. Actually, some of the streets a few blocks away from the Canal where you all met for a picnic aren't much better. En fait, ces immeubles ne se situent pas à Châtillon, mais à Malakoff... je passe devant bien souvent en rejoignant la porte d'Orléans par le bus. S'ils n'étaient pas en piteux état, ils seraient un témoignage typique de l'ancienne banlieue... mais ce ne sont que des taudis affreux désormais. J'étais effarée il y a 2 ou 3 ans de voir un panneau "A vendre" à l'une de ces fenêtres. Ces appartement sont donc toujours "dans le coup" sur le marché immobilier ??!! These are still beautiful and the image rich and admirable. You have created a beautiful image of something not so beautiful. There is somthing about this photo that is inviting. You will have to tell where in Africa you visited. You are so right about Paris (or the near suburbs, like where I live in Arcueil/Gentilly not just being beautiful buildings and, to be honest, slightly boring architecture. Even in Paris you often come across these sort of broken down, about to be torn down buildings, often covered in graffiti, and they always come out great as photographic subjects, especially if right next to one of those 'nice' Parisian buildings we're all supposed to like! There's beauty in most everything. It's a matter of training the eye to catch it. I've taken the wrong train a time or two in Paris and I've ended up in places most tourists never see, but I'm always grateful for the experience. What would life be without contrast? Amazing - I would assume that all cities have their areas of disrepair, but for some reason it's still a surprise to see - I thought it was somewhere else, not near Paris. I'm glad you enjoyed this. Actually like many of you said, it may show a place in which very few of us would consider living, but it makes a pretty good photo! I pass by it every day (and thank you Eric for telling me it's in Malakoff - I just assumed it was Châtillon because of the "Delices de Chatillon sign!) and evryday I keep thinking - I should take a photo. Now it's done. About "little India" - new the Gare du Nord. You have no idea how many times I went there hoping to make a good photo. And I never succeeded. It's Sunday evening in Paris right now and it's very cold. Can someone turn off the winter switch please, I think it's time now! I love this shot--look at the texture! Thank God we'll all not equal or we'd all be housed in Lefrak cities, like the Bronx, Brooklyn or the north edge of Paris. How can you make a cool picture of apartment complexes? You can't.Well, maybe you can, but this really makes me stop and look closely. Tell us about Africa please. the texture and colors are very intersting. okay..i don't know if anyone has ever tried this, but if you tip your screen back, the images have a very cool look - almost as if they were taken with infrared film or something. i do this with all of erics photos, this one looks particularly interesting. my other favorite is the one of le grand pyramid with snow falling. soooo awesome. try it. as for the neighborhood.... i grew up on south central los angeles and all people know is santa monica,beverly hills, venice and hollywood. Here's a fantastic blog if you want to see the other side of Los Angeles. And the photographer's a sweet guy. Interesting reactions to this photo. I see clean streets, sparkling glass, flower boxes, fully-habited buildings, well-preserved and operable windows, and painted and well-secured gates and bike racks. The signs of both businesses look new. I find no sadness, poverty or squalor in this photo. Just bustling humanity, albeit lacking the western concern for presentation. Doesn't every town, no matter how large or small, have a "not so nice" area? I've gotten lost in several of them. Although some have been slightly scary, this place looks like a nice place to get lost! I am an artist and this would make a lovely painting, can I borrow the image for a future oil painting? Why do these buildings need to be torn down? why can't they be painted and rehabbed?